- 1 to 5 cm length for 0.5 cm broad for Paranoplocephala mamillana. It is fixed at the junction between the small intestine and the caecum with a strong sucker.. The adult tenias emit segments containing thousands of eggs which are found in the large intestine, and are discharged in faeces. These eggs are ingested by the oribates which are microscopic acaridan which feed on vegetable scraps and thus play a part in ground fertilization. Infection is caused by the eating of forage mites (the worms intermediate stage of development). They become adults in 4 to 6 weeks and will lay eggs. 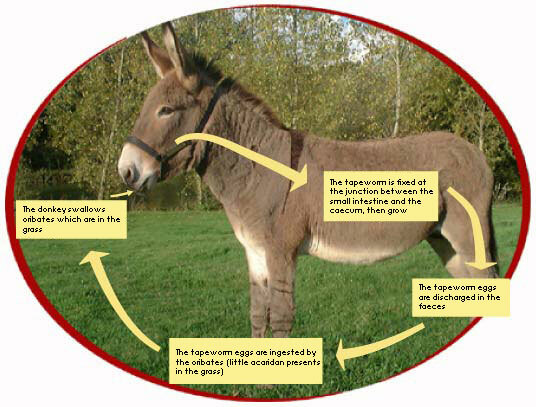 So, the concentration of the tapeworm in the pastures will increase during the season and will be the maximum in October-November. The first clinical signs will appear during the winter. - 25 to 200: arrest of the intestinal transit, bacterial fermentations and severed colics. - more than 200: possibility of necroses intestinal mucous membrane loading to rupture of the intestinal wall and peritonitis. It is advised to worm the donkeys in october/november. It is better to worm the donkey also in June in the event of donkey infestation. It is advised to keep the treated animals in the stable for a few days in order to not infeste the pastures. In this way the eggs laid after the treatment will not contaminate the pasture.